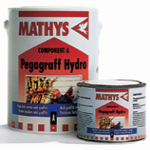 A permanent coating suitable for surfaces which are frequently being defaced. The two pack water based product is mixed and then applied by brush, roller or spray to provide a colourless satin finish for the protection of concrete, natural stone, brick, wood, coatings and paints. The coating is water vapour permeable and solvent resistant making it simple to use solvents to remove the graffiti. Two-component water-borne polyurethane acrylic. Colourless anti-graffiti protection. Also useful as a colourless varnish for internal walls. UV resistant. Abrasion resistant. Solvent resistant - allowing easy graffiti removal.